Taxis are easy to find in Ueno and they can be economical too. The standard fare for a small-sized taxi is the same throughout the 23 wards of Tokyo: 410 yen for the first 1,052 meters, and then 80 yen for every 237 meters after that. If you have more than one passenger to split the bill, then this is really quite inexpensive. 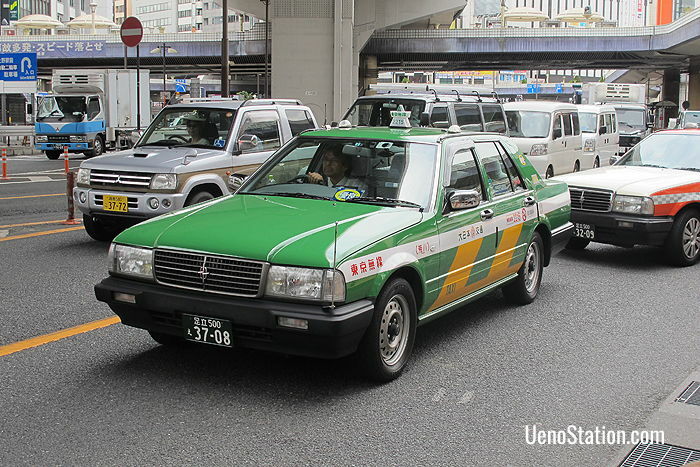 Most Japanese taxis come in three standard sizes: small (kogata 小型), medium (chugata 中型) and large (ogata 大型). Taxi fares go up according to these sizes. The most common size is the small kogata type which is big enough to seat four people. A medium chugata taxi also seats four people, but has more room. If you have over four people in your group, then you will need to take either a large taxi or two smaller ones. Please note that different taxi companies may charge different rates and that most taxi companies in Ueno charge a 20% evening surcharge between 22.00 and 5.00 am the next morning. Most Japanese taxi drivers can’t speak English. It is a good idea to prepare a map for your destination, or have the address written down in Japanese along with the telephone number. With the address the driver can use the taxi’s GPS system to locate your destination, or he can use the telephone number to call for directions. The rear doors of Japanese taxi cabs open and close automatically. It is best not to open and close these automatic doors yourself. 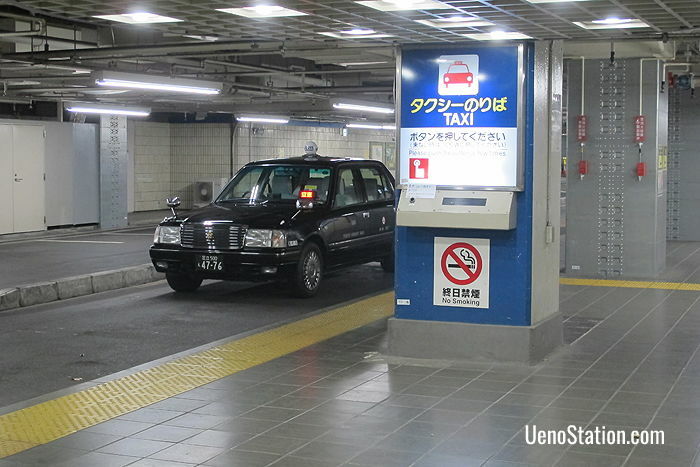 All Japanese taxis have meters, and taxi drivers are generally honest. You do not need to worry about being cheated. Japan does not have a custom of tipping. If you try to tip, your driver may be confused or embarrassed. It is generally better to simply pay the fare shown on the meter. Most taxis accept credit cards, but sometimes card readers cannot verify a card because of poor reception. It’s a good idea to carry some cash just in case. If you would like to pay with a credit card, show your card to the driver before your journey begins and check that your card is acceptable. 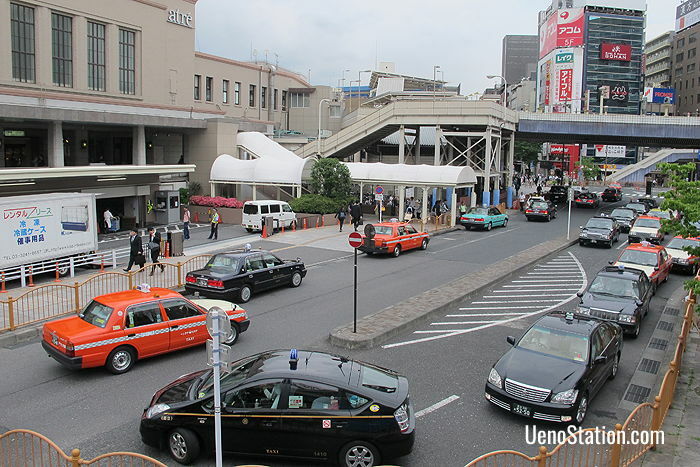 The main taxi rank in Ueno is right outside the Main Entrance of JR Ueno Station. 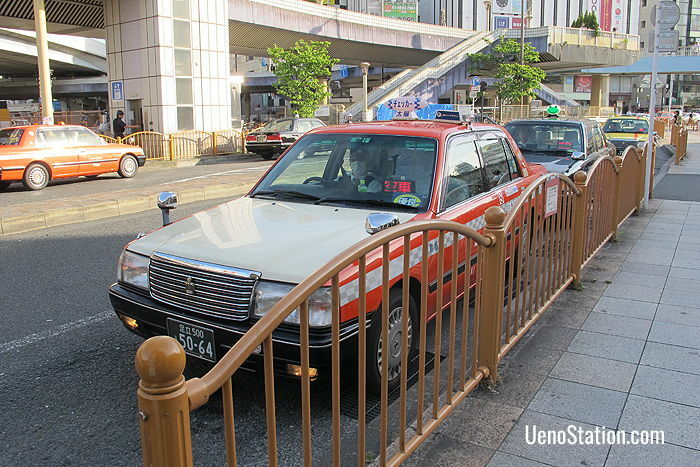 You can also find taxis lining up outside the JR station’s Park Entrance, and outside the Main Entrance of Keisei Ueno Station. 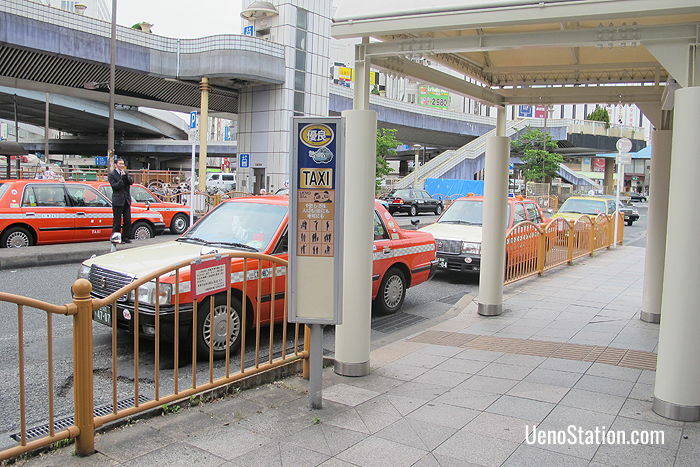 There is also a taxi stand by the Keisei Ueno Parking Lot of the Keisei station. If you don’t find a taxi waiting here you can push a button to call one. 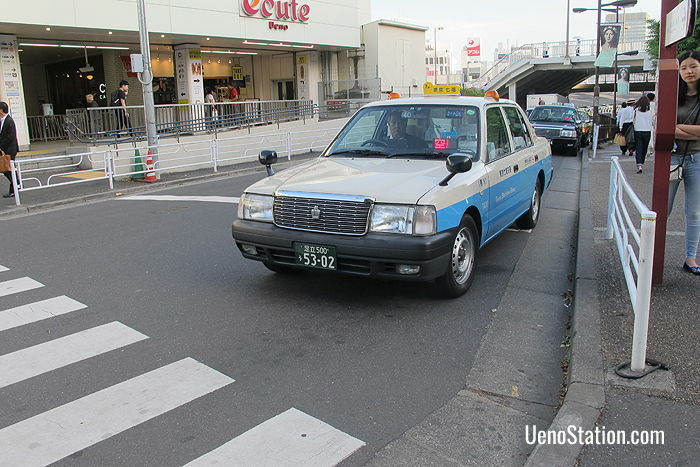 In other areas around Ueno you can simply catch a taxi on the street. Just raise your arm when you see a vacant one. If there is a green light in the passenger’s side window, the taxi already has a passenger. When there is a red light, the taxi is available. At night, a light on the taxi roof also shows that the taxi is vacant. At taxi ranks taxis line up for passengers and you simply take the first one that becomes available. This means you cannot choose a specific taxi company at a taxi rank. This is not a problem as Japanese taxi drivers are usually very reliable regardless of their company. At other locations however, you can choose your taxi company. 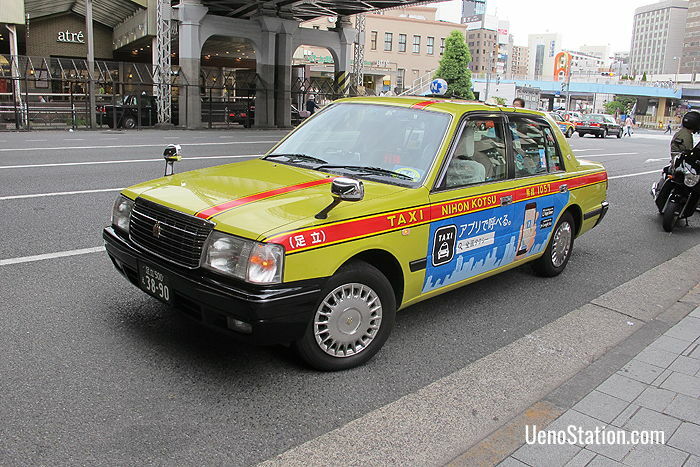 Below are listed four reliable taxi companies that you are likely to see in Ueno. Nihon Kotsu have telephone operators who can speak English and they have some multilingual drivers too. 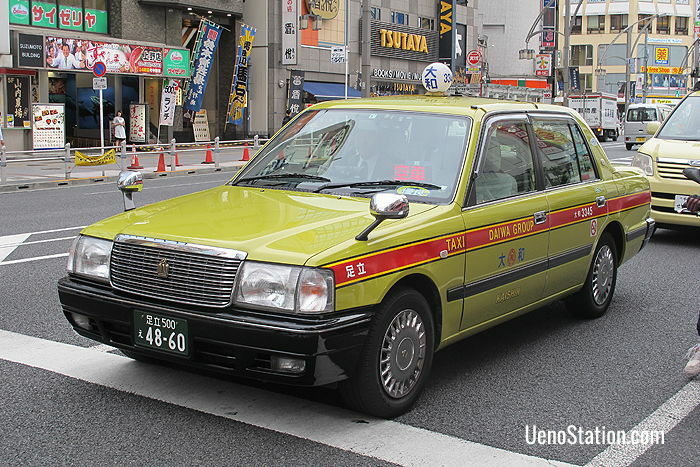 As well as regular taxis Nihon Kotsu also have a sightseeing taxi hire service. Sightseeing taxi drivers can speak English, Chinese, Korean, French or German. For details of tours and fares check the official website. Nihon Kotsu accepts the following major international credit cards: Visa, Master Card, American Express, JCB, and Diners Club. Daiwa take great pride in their regularly inspected cars and in the politeness of their staff. Daiwa accepts the following major international credit cards: JCB, Visa, Master Card, American Express, and Diners Club. 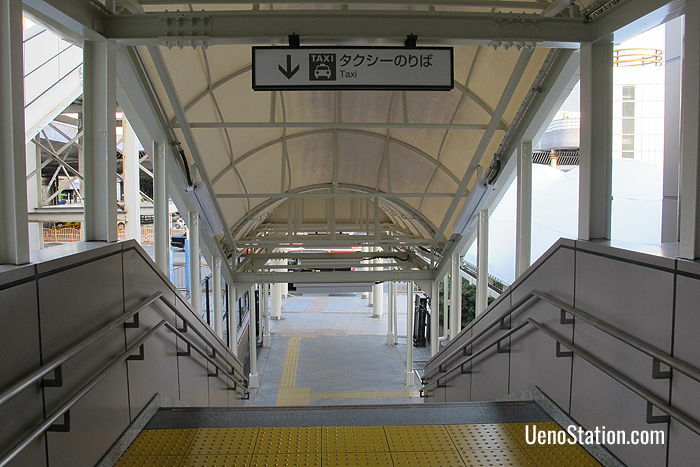 It is also possible to pay your fare with prepaid IC cards such as SUICA and PASMO. Tokyo Musen have both regular taxis and a sightseeing taxi hire service, but they do not have any special foreign language services. Tokyo Musen accept the following major international credit cards: JCB, Visa, Master Card, American Express, and Diners Club. It is also possible to pay your fare with prepaid IC cards such as SUICA and PASMO. Checker Cab has bright orange taxis which are very easy to recognize. Checker Cab accepts the following major international credit cards: JCB, Visa, Master Card, American Express, Diners Club, and UnionPay.